Update (10:15 ET): BBC political editor Laura Kuenssberg offered a quick summary of what May intends to say during this morning's speech. Other reports suggested that May has a new deadline in mind: Some time in late January - though she's reluctant to put a date on it. Update (10:10 am ET): Roughly one year since the UK and Ireland committed to creating a 'backstop' that would guarantee that no hard borders would return to the island of Ireland regardless of whether the UK and EU succeeded in negotiating a new trade deal, the 'backstop' remains the biggest obstacle to a Brexit treaty. And in the face of Brussel's intransigence, it looks like the two neighbors could band together to try and 'get creative' to force a breakthrough. Update (9:30 am ET): Jeremy Corbyn is calling off his dogs...for now, at least. After garnering support from Scottish MPs for a possible no confidence vote in the government, Labour is reportedly considering allowing May one last chance to renegotiate the backstop with Brussels before moving ahead with a challenge that could result in another referendum, or worse (for the conservatives) another general election. Meanwhile, conflicting reports about about whether May will be able to unilaterally cancel tomorrow's 'meaningful vote' on the Brexit deal, or whether Parliament must approve the withdrawal of the motion (a vote that many suspect May might lose). Meanwhile, ERG MPs are saying they expect to win the 48 no confidence letters needed to call for a leadership challenge within the conservative party. But reforming the backstop won't necessarily win over all of the votes May needs: DUP leader Arlene Foster said Monday that the 10 MPs in her party want May to get rid of the backstop in its entirety. Update (8:55 am ET): May has reportedly told several of her senior ministers that she will be seeking a "legally binding assurance" from Brussels that the backstop won't leave the UK trapped in the EU Customs Union indefinitely. She also said that allowing a vote on the deal as is would be too risky. PM told Cabinet Tories would suffer a 'notable' loss if they pressed ahead with vote on her deal. PM told Cabinet 'this is the right deal' and claimed that there is 'broad support' for getting it through but acknowledged that the backstop is a concern. Sounds like she could head to Brussels imminently to attempt to try and secure new terms. Update (8:30 am ET): The pound hit fresh 18-month lows following a report that May will return to Brussels to seek to reopen negotiations on the backstop. Meanwhile, No. 10 Downing Street has found a way to circumvent a vote on whether to cancel the Brexit vote. As we noted earlier, the uncertainty surrounding May's push to reopen negotiations, and the possibility that the options on the table have shifted to between 'no deal' and 'no Brexit' (which in itself increases the likelihood of 'no deal'), are weighing on investors' optimism. Government source says there will not be a vote on business motion to cancel Tuesday's Brexit vote. "We are replacing the business with a new statement but it isn’t a motion and therefore isn’t voteable." Update (8:15 am ET): Ahead of May's speech later this morning, another wrinkle in the back-and-forth surrounding May's plans to pull the vote has emerged. One conservative MP insisted in a tweet that May would need to consent of Parliament to pull the vote. Put another way, she needs a vote to pull the vote. And it looks like she doesn't have those votes, after all. Update (7:30 am ET): Though reports about the delay haven't been confirmed, enough UK media outlets have reported on it to suggest that Tuesday's meaningful vote on May's Brexit plan will be delayed. Initial reports suggest the vote will be moved to next week. As analysis begins to trickle in, Bloomberg reported that the possibility of a better deal could help bolster UK equities. But just as likely, fears about the possibility of Labour taking over the government could hurt shares and the pound. The question everyone is going to be asking each other after the Brexit vote was pulled is - what next? The information vacuum has sent traders scurrying for the safety of gilts, weighing on GBP. The bulls will hope this is just a pause while a few more compromises are wrung out of Europe -- or even better from their perspective, for another referendum. 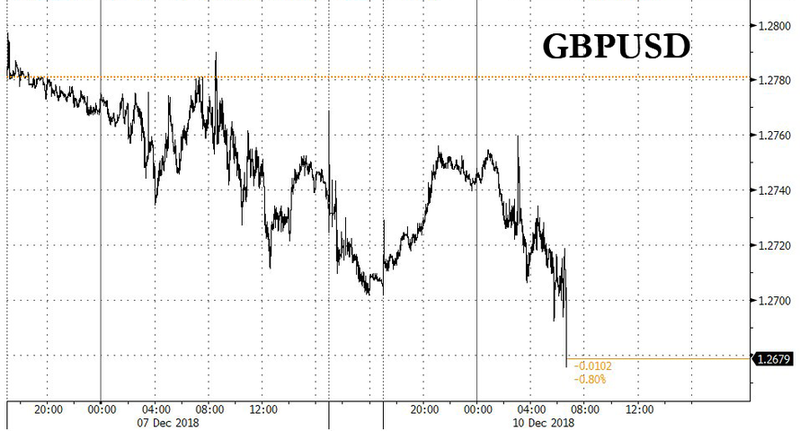 But traders will be wary of the risk that this triggers an election, raising the possibility of a Labour victory that might spark a selloff in gilts (that scenario would also probably still be GBP negative). Another place where election risks would show up is in utility stocks, given Labour leader Corbyn's nationalization plans. While they're down today, they're not extending losses. Keeping an eye on them, and U.K.-focused banks, might give macro investors a clue as to what the market believes the next steps on the Brexit trail will be. But with several MPs interpreting the delay as the effective 'defeat' of May's deal, analysts at Mizuho say the pound could drop as low as $1.25 if the EU steadfastly refuses to renegotiate. The pound should continue weakening as the EU will not renegotiate the U.K.’s withdrawal deal, regardless of whether British Prime Minister Theresa May pulls the parliamentary vote or not, says Neil Jones, head of currency hedge fund sales at Mizuho. 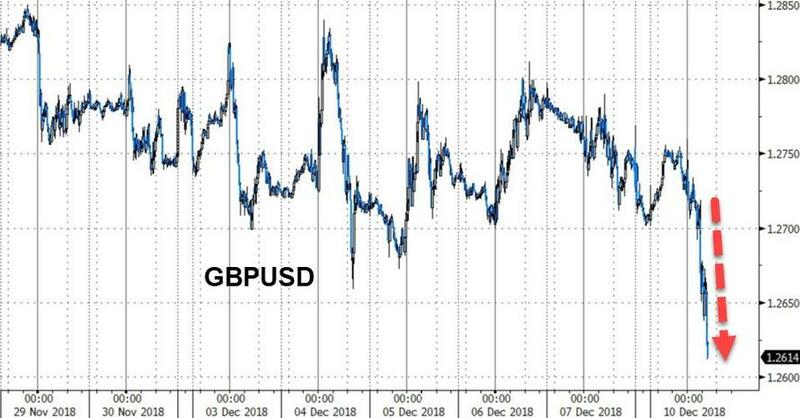 Anxieties surrounding the possibility of a 'no deal' Brexit appear to be dominant in the minds of traders: To wit, cable has extended its drop to a new YTD low of $1.2644. A spokesperson for Theresa May shocked investors on Monday when they insisted that Tuesday's 'meaningful vote' on her 'final' Brexit plan would move ahead as planned, countering rumors that May had been planning to tell MPs that the vote would be cancelled during an 'emergency' conference call. EU ministers have apparently stood by their position that the deal on the table is the only possible deal, and that negotiations would not be reopened. All of this is happening against a backdrop that one might expect would be favorable for the pound and UK markets: As was widely expected, the ECJ formally ruled on Monday that Parliament could unilaterally cancel Brexit by voting to revoke Article 50, according to the Financial Times. Mere minutes after reports about the spokesman's comments hit the tape, Bloomberg reported that May has indeed called for Tuesday's vote to be rescheduled because it is facing a "huge defeat" that could potentially destabilize her government. By rescheduling the vote, May will have time to return to the EU and try to "handbag" its leaders for a better deal, though they have insisted at every turn that the deal on the table is the "final" deal. On Monday, a spokeswoman for Jean Claude-Juncker insisted that "we won't renegotiate. Citing two sources, the BBC added that the word on the street is that the vote will be cancelled - though that has yet to be officially confirmed. A reporter from Sky News said, citing a senior government source, that May will need a reason to justify delaying the vote, such as plans for a "dash to Brussels". May is expected to make a statement to Parliament at 3:30 pm London Time (10:30 am ET in New York). The statement is reportedly titled "Exiting the European Union". MPs who had been planning to vote for May's deal are less than pleased about reports that the vote will be cancelled. Nobody knows what could happen if/when Parliament votes down the deal, according to the Telegraph. Setting aside that more than 100 Tory MPs have joined with the DUP and SNP in pledging to vote against Theresa May's draft Brexit deal, May's purported "plan" to force the deal through in a second vote as turbulent markets scare MPs into voting for the deal or risk economic chaos has never looked more tenuous. May's deal is opposed by both Brexiteers and remainers, and even those who support the deal admit that it is "imperfect" but preferable to "no deal." Should her conservatives lose the vote, Labour is planning to call for a vote of no confidence in the government (for which it would only need the support of a handful of Tory defectors) as leader Jeremy Corbyn seeks to push for a second referendum. Meanwhile, Tory ministers are considering a range of options, including pushing for a "Plan B" deal that would resemble the increasingly popular "Super Norway" scenario, to throwing their support behind a second referendum. Amid the chaos of the conflicting headlines, one thing is increasingly clear: The possibility that Brexit may be cancelled has almost never looked so high.